I loved my grandmother. She was a great southern cook. My grandmother was a wife, mother, teacher and a farmer’s daughter. This is her cornbread recipe. Ask anyone that has had a piece of this cornbread and they will tell you that it is addictive. One of my favorite things about it. It is simple. OK… here I have to admit. I don’t really measure. If you have questions please email me. Preheat Oven to 375. In an iron skillet or 2 (I usually make 2 pans at once). Add enough olive oil to just cover the bottom of the skillet. JUST is the main word. The oil needs to barely cover the bottom of the skillet. Place your skillet(s) in the oven. Leave in oven for approx 4-5 minutes. While oil is heating mix extra fine corn meal with water and salt. Start with about 1 cup of cornmeal. Add water until slightly soupy. It can not be thick but not to thin. Like pancake batter. With about 1 cup of cornmeal add 1 teaspoon of salt. Remove heated oil from oven. Spoon cornmeal mixture into 2-3 cakes in the skillet. The mix will sizzle when you add it to the oil. Place pans back in oven. Bake approximately 15 minutes. Once crispy and light brown on edges remove from oven. This is so easy and great because the ingredients are always in your kitchen. Try it a few times. you will get the hang of it. It is a favorite among our family and friends. 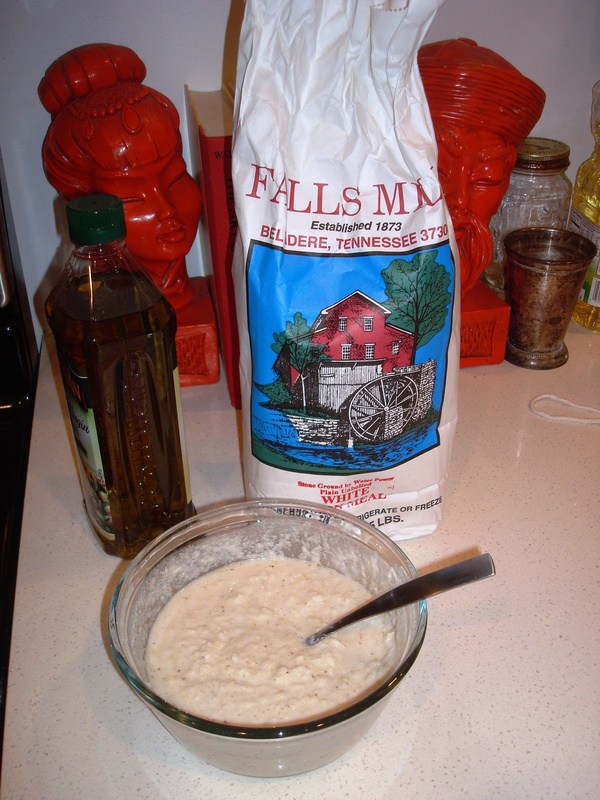 Paige – Is the type of cornmeal you use “key”? I have heard so many different theories on this. And I do have my favorites – right now it’s McEwen & Sons (which is made right here in Wilsonville), but I really like Anson Mills too. I notice that you have one from Tennessee – I’ve never seen this one – will have to find it. I have Scott’s grandmother’s recipe, and I will tell you, your grandmother’s seems a lot easier. Thanks, as always, for your recipes … I LOVE reading them!! Extra Fine is really hard to find. To make the really flat crispy cornbread like this recipe you must have extra fine. They have it at Piggly Wiggly usually or at some IGA stores. I have never found any at a Publix or Whole Foods. When I buy it I buy extra and keep it in the freezer.